Eat around the world without leaving Chicago on this small group, 4-hour food bike tour. Enjoy the city's best ethnic cuisines while biking through its most historic neighborhoods and beautiful park paths. Taste Polish pierogis, French sweets, and Mexican tortas, along with local craft beer and the famous Malort liqueur. Marvel at the beautiful architecture and fascinating ethnic stories of Chicago's River North, Fulton Market, Ukrainian Village, Wicker Park, Bucktown, and Lincoln Park. Finish up with a ride along the new 606 elevated trail and the gorgeous Lakefront Trail. Begin your 4-hour tour in Streeterville, just footsteps from Navy Pier. 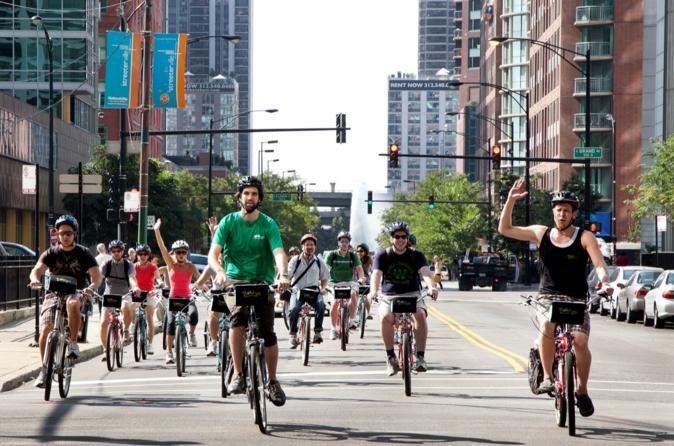 Bike West through Chicago's bustling River North. Cross the iconic Chicago river, then ride through historic meatpacking district Fulton Market, now Chicago's restaurant and tech ground zero. Sample a delicious Mexican tlayuda (a giant torta) and a beer at a celebrity chef's new brewpub. Then ride past Google's new headquarters and some beautiful murals before arriving in Ukrainian Village, where you will taste the world's best Polish pierogis. From there, pass gorgeous 19th-century mansions before having another delicious ethnic snack in hipster hot spot Wicker Park. Bike along the new 606 trail, a bike path on a formal elevated rail line, and then sample the Chicago handshake at a local Bucktown pub (hint: it involves Malort, a unique local liqueur). From there, head to quaint Lincoln Park for a sweet French treat, and finish off the tour with a beautiful ride down Chicago's world-famous Lakefront Trail. This is a public tour so you may be riding with others. Special Offer - Travel between now and May 24, 2018 and save 10% compared to the local supplier's prices! Valid Monday - Thursday only - Book Now!